Antonin, from Lyon in France, left the farm on Friday 20th to head for Madrid. Antonin volunteered with us for 6 weeks, and worked very hard, even picking salad for 3 hours on Friday morning before catching his train. We hope you had a good journey, and wish you all the best of luck in Spain and beyond. Antonin picking sugar snap peas in the polytunnel on his first day on the farm. Small (£6) veg box - potatoes, rhubarb, cucumber, mixed herbs, mixed salad, and chard - shown here with optional extras of half a dozen eggs (£1.50), large sourdough loaf (£3.10), one litre full cream milk (£1.20). Standard (£10) veg box - potatoes, "wet" elephant garlic, rhubarb, mixed salad, cucumber, mixed herbs, chard, spring greens, and purple sprouting broccoli. 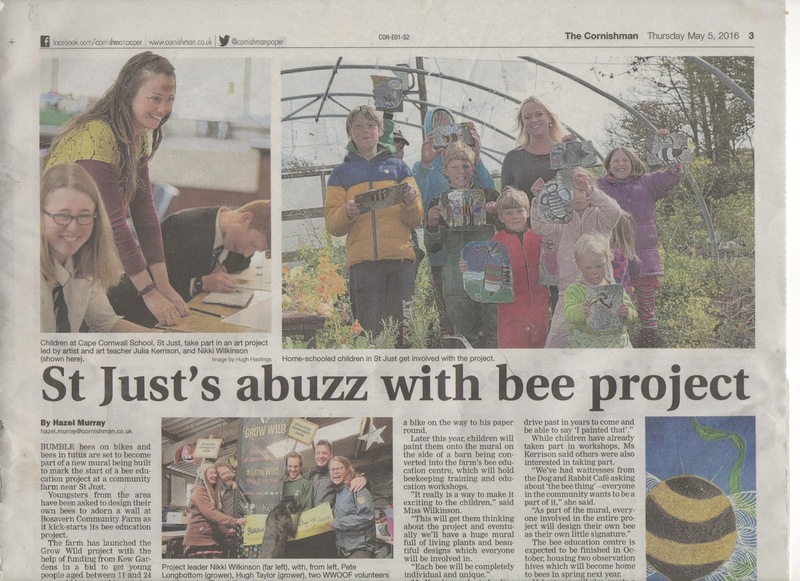 Bosavern Community Farm, and in particular our bee-keeping project, has been featured on the Agricology website. Please follow the link below to see the full piece. Small (£6) veg box - chard, white cabbage, potatoes, "wet" elephant garlic (looks like a big leek, to which it is closely related), purple sprouting broccoli, green sprouting calabrese. We started planting our onions on Sunday 8th May, and finished on the Tuesday morning. This year we have planted 40kg of sets of Sturon onions, and 40kg sets of Red Baron onions, so slightly more than last year. This year though we plan to keep the rabbits and weeds away from them so as to get a better harvest! Allie (left) and David (right) on the back of the tractor planting onions in morning drizzle. Alex, an architect from London, left the farm yesterday to return to work, after 2 weeks volunteering as a wwoofer with us - many thanks Alex for your help, and we hope to see you again some day. Alex helping to prepare the Sausage polytunnel for tomato planting. 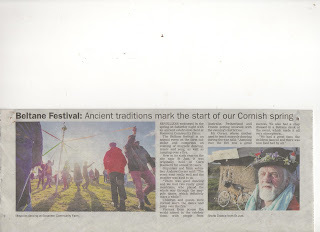 Beltane, the Gaelic festival to mark the beginning of summer, was celebrated at the farm on the evening of 30th April. 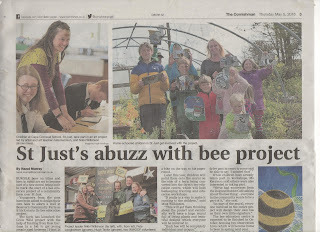 This is the sixth consecutive May Day Eve that we have held this community celebration on the farm, and it improves every year - this year we used the cob roundhouse to lay the food out in instead of a tent, were treated to live musicians plus a choir, and even had some variations on the traditional maypole dance! More than fifty people came to the farm, and were treated to good weather and a beautiful sunset. Beltane was celebrated near in and around the cob roundhouse this year. Many thanks to Mike, centre, for organising the live music once again. Also thanks to Kelsey and the Land And Sea choir for their performance. St Just's 28th annual Beltane maypole dance. Tigerlily garlanded for the occasion. Watching the dancers trying to untangle their knots. Many thanks to Andrew (and Jenny) for organising the celebration, and explaining the dances! Sunset over the sea, as seen from the maypole. Last Friday's small £6 veg box contained French breakfast radishes, parsnips, Sarpo Mira potatoes, Oriental greens, purple sprouting broccoli, and spring greens. The standard £10 box contained Sarpo Mira potatoes, parsnips, mixed salad leaves, chard, French breakfast radishes, white cabbage, purple sprouting broccoli, and spring greens. To order yours please phone the farmhouse on 788454. We planted our main crop of tomatoes yesterday, April 30th, being 287 plants in the Sausage polytunnel. We have space for 30 more plants, which we will propogate using side-shoots from existing plants in the coming week. Our early planting was 52 plants at the beginning of March, and despite the cold they are producing lots of flowers. Our first tomato flowers of the year, sown at the beginning of January, planted in a polytunnel early March. Our main tomatoes were sown at the very end of February, and we have 13 varieties, mostly old favourites (sungold, gardener's delight, golden queen, quadro, tigerella, yellow submarine, jen's tangerine, stupice, chocolate cherry, costoluto di fiorentina, berner rose) and a couple of trial varieties (ruby, and orange banana). Our early sowing included several of the above, and also galina, an early yellow cherry tomato. Charlie picking winter purslane prior to pulling out the old salad plants. Signe pulling the old salad plants out of the polytunnel. Our hot-bed full of pepper, aubergine, chilli, and tomato seedlings ready for planting out. Signe and Antonin digging and composting the tomato beds ready for planting. David and Allie digging and watering holes, with the tunnel already half planted. Alex and Allie embarking on the final line of plants. Signe, from Stockholm in Sweden, left the farm on Friday after volunteering with us for two weeks - thank you for all your work with us, and enjoy your onward travels! Signe spreading compost in a polytunnel ready for planting tomatoes. Small £6 veg box - mixed salad leaves, rainbow chard, savoy cabbage, purple sprouting broccoli, potatoes, and dried chillies - with optional extras of half a dozen free-range eggs (£1.50), a litre of organic milk (£1.20), and a large organic sourdough loaf (£3.10). Standard £10 veg box - potatoes, French breakfast radishes, parsnips, savoy cabbage, mixed salad leaves, Oriental greens, purple sprouting broccoli, spring greens, and dried chillies - with optional extras of a dozen free-range eggs (£3), and two large organic spelt loaves (£3.10 each). Our small £6 veg box containing French breakfast radishes, parnsips, mixed salad leaves, purple sprouting broccoli, oriental stir-fry greens, and potatoes. On Wednesday 13th April we collected 120 new Colombian Black-tail hens from a poultry farm near Launceston, and brought them down to Bosavern Community Farm. They were 22 weeks old, and were just starting to lay eggs, even laying in the back of the van on the A30. They have settled in well, are wandering all over the field meeting our other hens, and we now have plenty of small "pullets" eggs for sale in the farm shop at only £1 per half dozen. Venturing outside for the first time in their lives.